John Monckton, 1st Viscount Galway was born in 1695.1 He was the son of Robert Monckton and Theodosia Fountaine.2 He married, firstly, Lady Elizabeth Manners, daughter of John Manners, 2nd Duke of Rutland and Catherine Russell.1 He married, secondly, Jane Westenra, daughter of Henry Westenra and Eleanor Allen, in November 1734.1 He died on 15 July 1751. [S21] L. G. Pine, The New Extinct Peerage 1884-1971: Containing Extinct, Abeyant, Dormant and Suspended Peerages With Genealogies and Arms (London, U.K.: Heraldry Today, 1972), page 250. Hereinafter cited as The New Extinct Peerage. [S82] Ashworth P. Burke, editor, Burke's Genealogical and Heraldic History of the Peerage, Baronetage and Knightage, 64th edition (London, U.K.: Burke's Peerage Ltd, 1902), page 1367. Hereinafter cited as Burkes Peerage and Baroentage, 64th ed. [S22] Sir Bernard Burke, C.B. LL.D., A Genealogical History of the Dormant, Abeyant, Forfeited, and Extinct Peerages of the British Empire, new edition (1883; reprint, Baltimore, Maryland: Genealogical Publishing Company, 1978), page 491. Hereinafter cited as Burkes Extinct Peerage. [S15] George Edward Cokayne, editor, The Complete Baronetage, 5 volumes (no date (c. 1900); reprint, Gloucester, U.K.: Alan Sutton Publishing, 1983), volume I, page 120. Hereinafter cited as The Complete Baronetage. [S6] G.E. Cokayne; with Vicary Gibbs, H.A. Doubleday, Geoffrey H. White, Duncan Warrand and Lord Howard de Walden, editors, The Complete Peerage of England, Scotland, Ireland, Great Britain and the United Kingdom, Extant, Extinct or Dormant, new ed., 13 volumes in 14 (1910-1959; reprint in 6 volumes, Gloucester, U.K.: Alan Sutton Publishing, 2000), volume VII, page 628. Hereinafter cited as The Complete Peerage. Thomas Chaplin was born in 1684. He was the son of John Chaplin.2 He married Diana Archer, daughter of Andrew Archer and Elizabeth Dashwood, on 8 July 1720. He died on 17 January 1747. [S6] G.E. Cokayne; with Vicary Gibbs, H.A. Doubleday, Geoffrey H. White, Duncan Warrand and Lord Howard de Walden, editors, The Complete Peerage of England, Scotland, Ireland, Great Britain and the United Kingdom, Extant, Extinct or Dormant, new ed., 13 volumes in 14 (1910-1959; reprint in 6 volumes, Gloucester, U.K.: Alan Sutton Publishing, 2000), volume III, page 1. Hereinafter cited as The Complete Peerage. 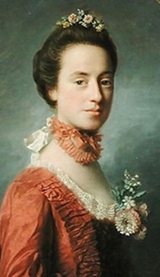 Charles Tompson married Juliana Kett, daughter of Thomas Kett.